A campaign that shows owners quick and simple ways to teach horses to behave properly during veterinary procedures has been launched in Britain. The British Equine Veterinary Association’s “Don’t Break Your Vet” campaign is designed to address what the organisation says is a serious problem: Equine vets have one of the highest injury risks of all civilian professions. The campaign aims to help horse owners make life safer for their horses, themselves and their vets. It comprises a series of short videos, featuring vet and equine behaviourist Gemma Pearson, providing quick and simple ways of teaching horses to be quiet, relaxed and safe for injections, clipping, worming, examinations and other veterinary procedures. The campaign is supported by some of Britain’s leading riders and competition grooms. A research paper recently published in the journal Equine Veterinary Education found that a typical equine vet may expect to suffer seven to eight work-related injuries that impede them from practicing, during a 30-year career. This is far higher figure than other civilian occupations such as the construction industry, prison service and the fire brigade. Bruising, fractures and lacerations to the leg or the head were the most common injuries reported, with the main cause being a kick with a hind limb. 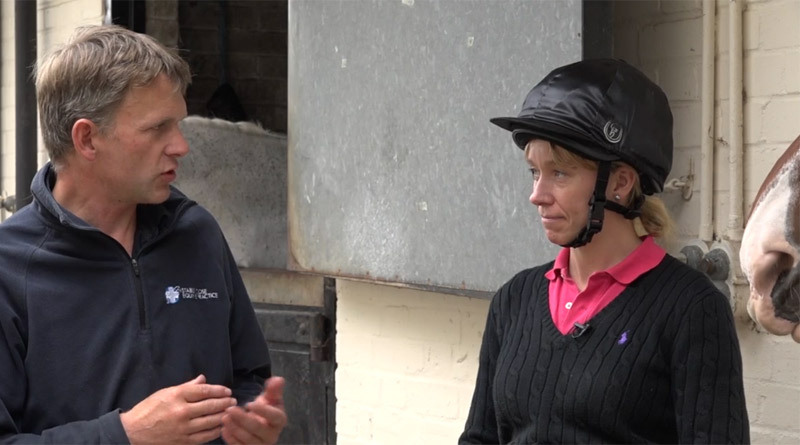 Horse vet Malcolm Morley chats with vet and equine behaviourist Gemma Pearson, whose videos provide quick and simple ways of teaching horses to be quiet, relaxed and safe for veterinary care. Nearly a quarter of these reported injuries required hospital admission and 7% resulted in loss of consciousness. “Many accidents occur when vets are trying to work with horses who have learnt to avoid examination or treatment,” the association’s chief executive, David Mountford, said. “This is dangerous for the vet and the handler but it also often results in a stressed horse and can increase the time and/or cost of reaching a diagnosis or treating an injury. David Catlow, the director of clinical services for the animal charity Blue Cross, said the videos would assist with behaviour training in horses to help them remain calm and manageable in all sorts of circumstances.